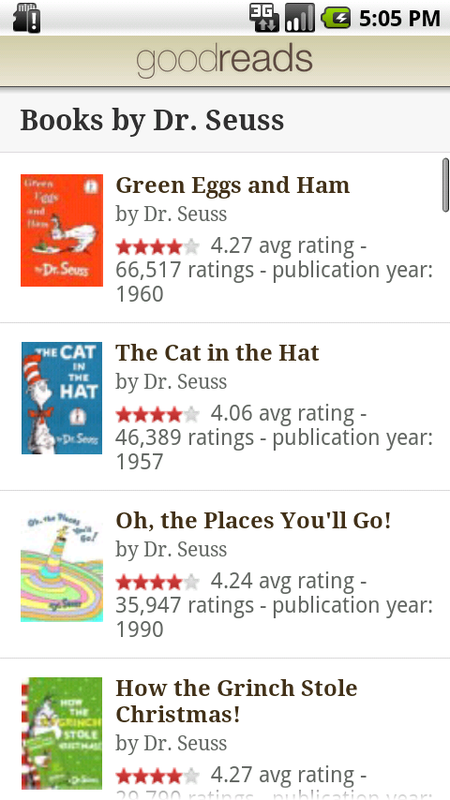 Announcing the Goodreads Android App! We heard you! Due to overwhelming popular demand, we've developed a new app for all you Android aficionados out there. Wander through the stacks of your local library or peruse the shelves of your favorite bookstore while simultaneously browsing Goodreads reviews. The next time you are deciding what to read, your to-read list will be handy. We're excited to make Goodreads more mobile and easier to access, and we will continue to add fun features for Android fans! Woo hoo! Been waiting a long time for this. Awesome - just downloaded and so far I love it! 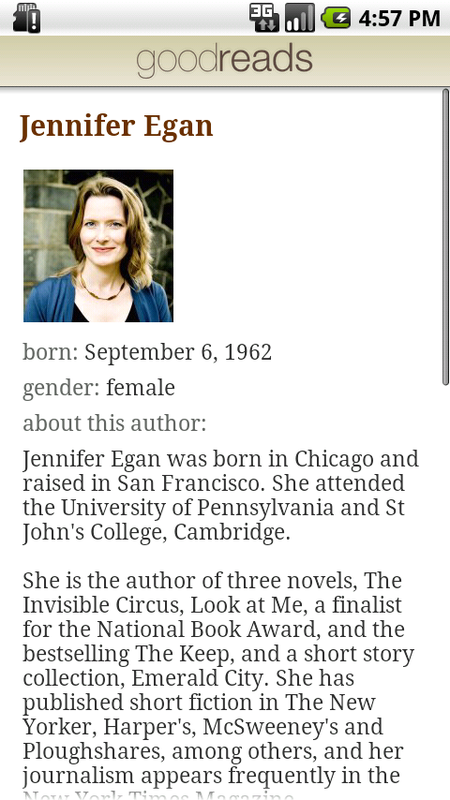 Please make official Goodreads for Windows phone 7 METRO STYLE! :) love you! At last thank you guys!! 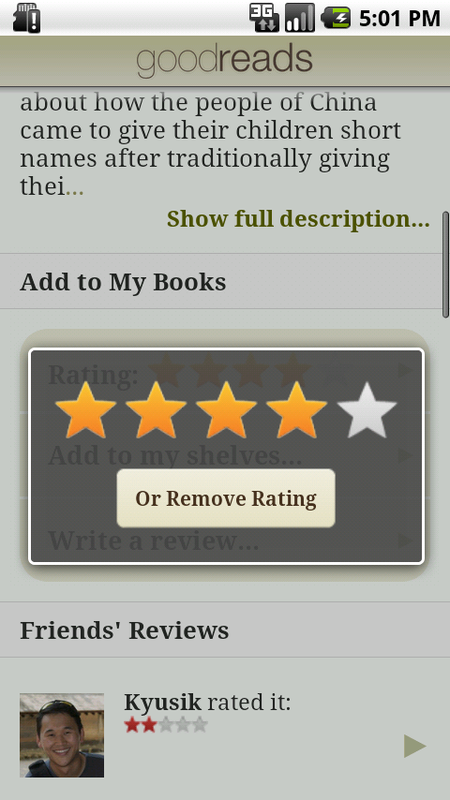 i literally did a search for a goodreads app 2 days ago.. thanks! wow so glad to finally see an android app out!! Downloaded right away and played with it looks good!! Yay, thanks! Been waiting forever for this! Love it so far! Any plans to add books by scanning the barcode? That would be even better! Downloaded it. Played with it. Like it! Yay!!! I've been waiting for this!!! Thank you!!! Finally! I am a multi platform user. Any chance the iPhone app will be modified for iPad? Thank you! 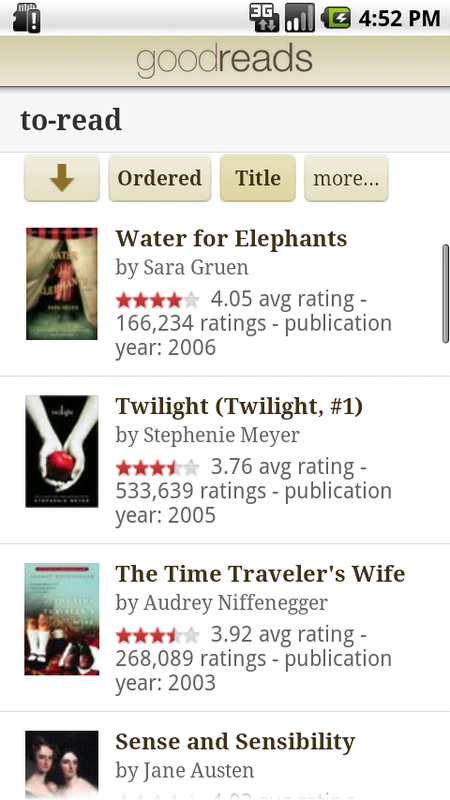 I didn't think I could love goodreads more and you did! Awesome! I have try this out! I got my first smartphone last week! 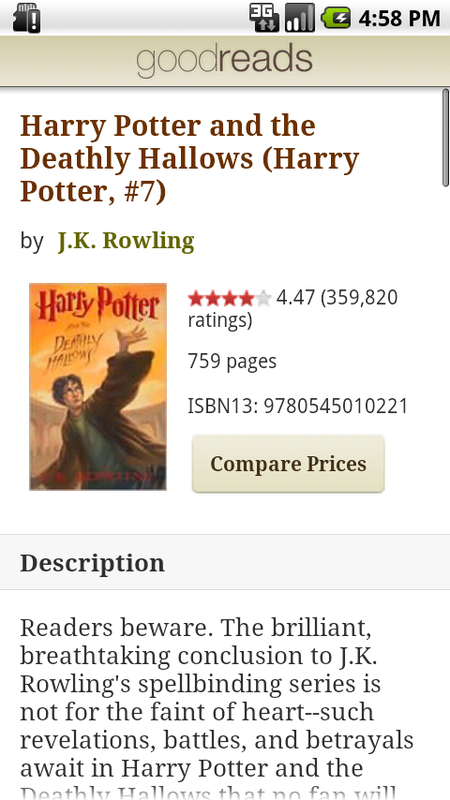 I am glad that Goodreads have an app for this! This makes me wish I had my droid phone. Luckily I'll be getting a new one next week! Can't wait to try it out. I'm really happy an android app is now available. Can't wait for ability to scan barcodes! We are thinking about the iPad (no dates yet! ), but currently not many plans for the BlackBerry beside some informal talks. Is Android 1.5 not supported? I was able to download the app but it force closes every time I try to open it. works very fast! barcode scanner?